England has qualified for the 2018 World Cup knockout rounds after beating Colombia on penalties. Harry Kane scored from the penalty spot just before the hour-mark, his sixth goal of the tournament. The in-form Tottenham striker, who was dragged to the ground by Carlos Sanchez, was forced to wait for several minutes before taking the spot-kick. However, he held his nerve and dispatched his third penalty of this summer’s World Cup finals past David Ospina. Kane now finds himself two goals clear of Belgium’s Romelu Lukaku in the race for the World Cup Golden Boot award. Only one Englishman has ever managed to win the coveted individual accolade before: Gary Lineker in Mexico ’86. Colombia, who were without their talisman James Rodriguez, resorted to the dark arts in a bid to unsettle their opponents. Wilmer Barrios somehow avoided a straight red card for a headbutt on Jordan Henderson. Raheem Sterling, meanwhile, was shoulder barged by one of the Colombian coaches as he made his way towards the tunnel at half-time. Sterling, who had been involved in a minor scuffle with Yerry Mina moments earlier, was barged by Eduardo Urtasun to the astonishment of everyone. Fourth official Matt Congler saw the bizarre incident and warned Urtasun over his conduct. 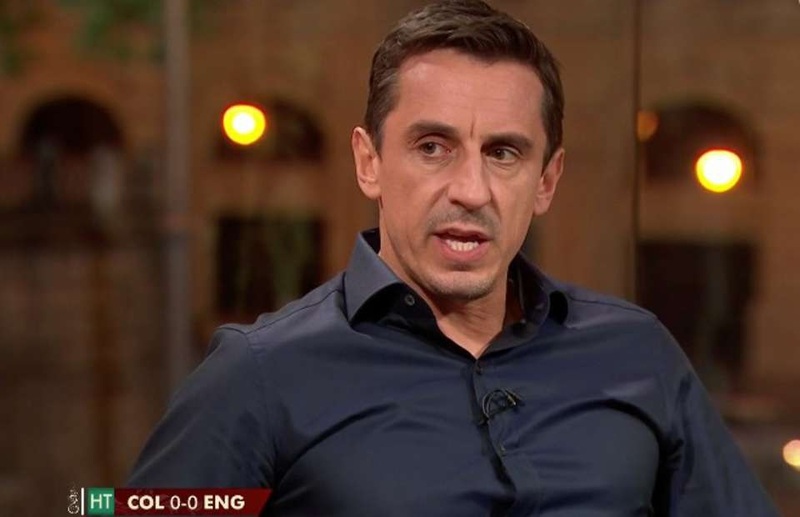 The ITV panel discussed the incident at half-time and former England right-back Gary Neville made everyone laugh with his assessment of Urtasun. “That coach is a numpty for doing that to Raheem Sterling,” Neville said, much to the amusement of viewers. Sterling didn’t let the incident faze him, fortunately, and went on to play up until the 87th minute of the match when he was subbed off for Jamie Vardy. However, moments later and Yerry Mina scored a dramatic late headed equaliser for the Colombians, forcing the game to extra-time. No further goals were scored and the game subsequently went to penalties, which England won - yes won!